Leptis Magna was widely regarded as one of the most beautiful Roman cities and its excellently preserved remains make it one of the best Roman sites. 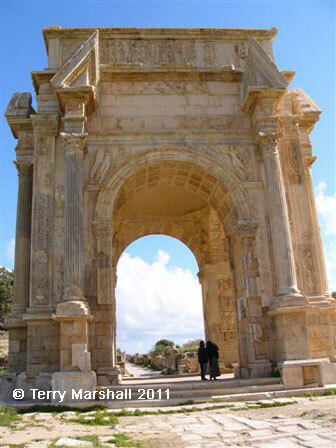 Founded by the Phoenicians in the 5th century BC, Leptis Magna came under Roman control in the 2nd century BC. It flourished under the reign of its native son, Septimis Severus, in the 3rd century AD who enlarged and embellished the city, becoming second only to Rome with a population of 100,000. Buried under sand for centuries, the city has been extensively excavated since the 1920s. Among its many highlights are the Gladiator Circus, amphitheatre, marketplace, theatre, basilica and the many forums, baths, streets and arches. Sabratha was a Phoenician trading post, part of the short-lived Numidian kingdom of Massinissa and under the influence of Carthage before coming under Roman control in the 2nd and 3rd centuries AD. It prospered as a trading centre for gold, ivory, leather, spices and slaves brought to the Mediterranean from central Africa which saw the city rebuilt with many impressive monuments. 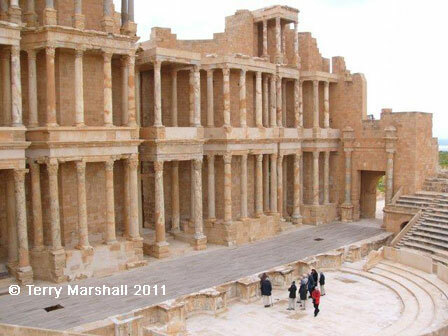 Like the more famous Leptis Magna, Sabratha today has some excellently preserved Roman ruins in a beautiful setting on the Mediterranean coast. Most famously, its theatre has a capacity of 5,000 and the stage area has been renovated with a three storey, marble-columned frons scena. Other features include the large forum surrounded by the temples of Liber Pater, Serapis, Hercules and Isis, the Christian basilica of Justinian and the Capitolium. Dougga was an important Punic city prior to Rome's annexation of Numidia in 46 BC but flourished under Roman and then Byzantine control. The ruins today form the most impressive Roman site in Tunisia. These include the capitolium dedicated to Jupiter, Juno and Minerva (one of the finest Roman monuments in North Africa), the forum surrounded by a marble colonnade, the amphitheatre, circus and public baths. The mausoleum in the southern part of town is the only surviving major Punic monument in Tunisia. 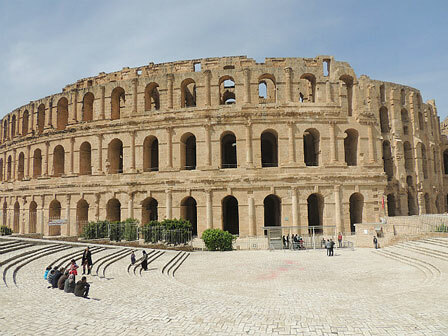 The small village of El Jem (known in classical times as Thysdrus) contains the impressive ruins of the largest Roman amphitheatre in North Africa, and the third largest in the world after the Colosseum in Rome and Capua near Naples. Built in the 3rd century AD, the amphitheatre was elliptical in form, probably four storeys high and designed to accommodate up to 60,000 spectators. Lack of funds and political rivalries meant the amphitheatre was never finished, but today it remains incredibly well preserved and intact. You can climb several storeys to survey the whole amphitheatre or explore the underground passageways where the gladiators and animals waited before being released into the arena. 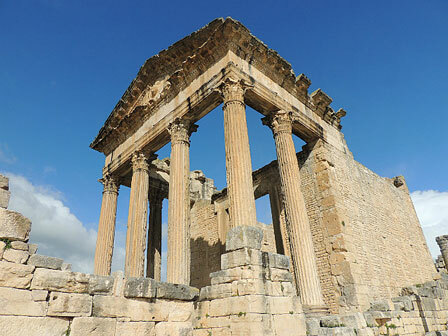 Founded in the 3rd century BC, Volubilis became an outpost at the edges of the Roman Empire in the 1st century AD, as capital of its province of Mauritania Tingitana. 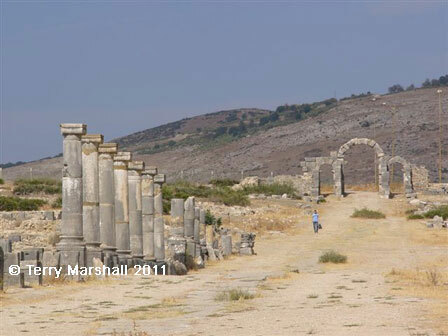 Housing the best Roman ruins in Morocco, Volubilis is best known for its numerous and detailed floor mosaics. Some of the notable structures remaining are the ruins of the basilica, capitol, the great houses of Orpheus and Ephebus and the triumphal arch of Caracalla which spans the decumanus maximus.